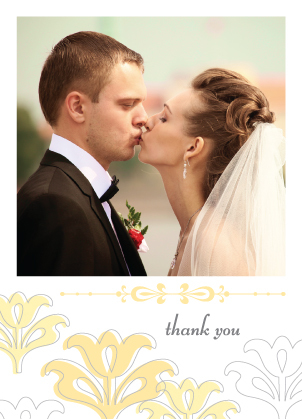 The final step of a perfect wedding is to follow the event promptly with wedding thank you cards. You'll need to send a wedding thank you note to each of your wedding party attendants as well as guests who've given gifts. This task actually begins the moment you compile your wedding guests' names and addresses to send out your wedding invitations. 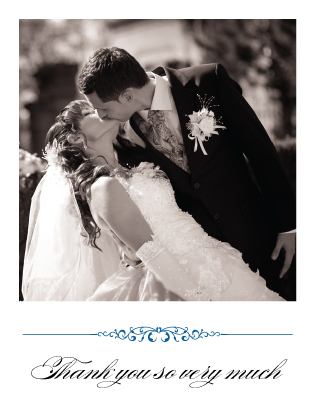 Be ready by ordering thank you notes for your wedding before you leave for your honeymoon. Don't wait until you've opened your last wedding gift either. Keep a record of what you've received and from whom as you open your wedding gifts. Just as you want a unique wedding invitation for your special day, your wedding thank you cards should be just as unique. You'll find that all LookLoveSend designs for wedding thank you notes coordinate with our unique wedding invitations, so you can tie together your wedding day style. In addition, you can really achieve that custom wedding invitation look by personalizing your wedding thank you cards with photos from the wedding, just as you can do with our wedding save the date cards and wedding programs. As with all our wedding stationery pieces, our wedding thank you cards print on only the highest quality paper and card stock. LookLoveSend has hundreds of designs for you to choose from, each one inspired by one of our own talented designers. We never outsource your wedding thank you cards to another printer either. We use our own state-of-the-printing presses, managed on-site by a professional print team. We not only guarantee you a quick turnaround time, but we handle your order to perfection from start to finish. Bring your perfect wedding to a close with a perfect wedding thank you card from LookLoveSend.